This PINK sweater has been in my closet for at least eight years. I haven’t worn it for a long time, and technically probably should have gone to the Good Will a long time ago. It’s so girly and feminine and the gathers on the shoulders I think are unique and different. I’m starting to see all kinds of different things in my closet now that my hair is PINK! Someone commented somewhere that my options would be limited now that I have a new hair color. It will be interesting to see what I come up with! I don’t want to feel limited, but I may. I know that last night I put on an orange tee shirt and that was definitely NOT WORKING! Here is an article from the Huffington Post that you might find interesting if you’re thinking about coloring your hair. I looked on Pinterest and most of what I saw was what you would expect….neutrals or pink itself. So far I’ve worn just that as well as black and white. I haven’t found that it’s been difficult with any of my makeup, which I thought that would have been the hardest! 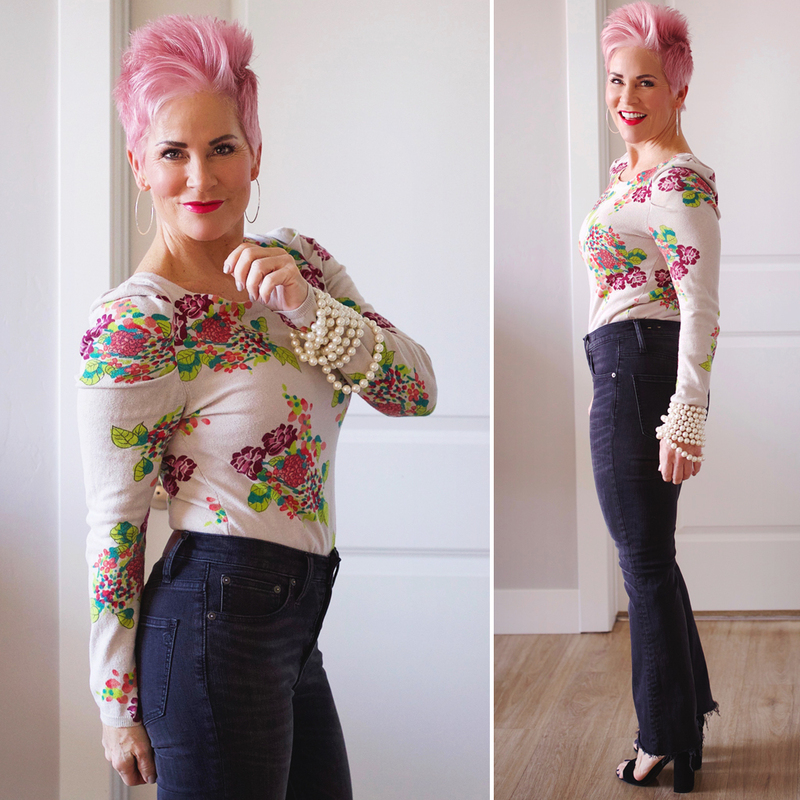 I’ve linked some really darling floral tops here for you! With Valentine’s Day coming up, any of them would be fun to wear with a skirt, pants, or jeans. My jeans are here. I’ve loved these high-rise button up the front jeans, with the flared frayed bottoms so much! These run big, so size down! I sized down two sizes! They are meant to be cropped, but for me pretty much a normal length! Ha!!! The pearls I have as my bracelet, are actually faux and meant to be a necklace. I’ve wrapped them around and around to make a bracelet, which I often do. I’ve worn these every way imaginable forever! Pink hair may be challenging but oh the possibilities! Nay sayers beware! I’m betting you will knock it out of the park! Can’t wait to see! I love the jeans. Low cut jeans with that itty bitty zipper is out for post menopausal women with hips!